The most rigorous control on plating baths is only one part of ensuring high-quality, reproducible results. Any impurities that remain on the surface of the part will inhibit the adhesion of the deposited material leading to possible flaking, peeling, or part failure. 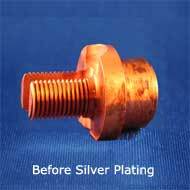 Cleaning can be further complicated by the need to plate parts that are made up of several different materials.